let's make another different suggestion. You have already added hide currency, and see the pools of a coin from the Coins tab. Hello. Patrike, please add the AnonyPoW algorithm for the ANON coin. The https://www.coincalculators.io/coin.aspx?crypto=anonymous-mining-calculator is indicated as follows. In the program, I can not change. Thank. I can't remove groups under my miners tab. Remove Group is grayed out for every group when I right click the name, even if it's empty with no miners assigned. I'm not trying to remove the default My Miners group, just others. Could anyone tell me why I have 45+ algorithms that are disabled? I have an nVidia 1060 GPU. But a more sure way would probably be enable the online services in the options for the algos you want to benchmark. do you think that is possible to mine with your miner? Patrike, please correct the SWAP coin settings. But you can also use nanominer from nanopool. For me it is a little bit faster than rhminer. It supports ethman API and this is supported from awesomeminer. it is as easy or difficult as obtaining it from the explorer of each coin, just like AM CU, which scrape each Explorer, but only supports 3 or 4, but when they have been updated, the scrape is no longer valid, it must be redefined to I can read. You can not get the Yimp hashnet and difficulty data as CTM does, because that YIMP also has a delay when it comes to obtaining the data, and at the end there is a very large lag. CC if you get the data of the explorer, or at least that seems because it is usually very accurate to what the explorer of each currency, but fails in the prices and can not choose so many exchanges, it takes a long time to read the new prices . If you obtain the data of everything through the APIs, we obtain the data of everything. That is to say, for this currency, the data of the currency of X supplier, and the price data of X supplier. In the currency tab, with double click on Tabs coins, and by default deactivated and with notices to read the information on the subject. I'm currently investigating how to design a solution that is flexible enough for most scenarios. The main goal will not be to try to replicate the AM CU features, but to offer more flexibility how to set the Difficulty and a few other properties of a Coin via external sources. What I'm looking at is a way to specify a data source API URL (coin statistics provider, block explorer, exchange, wallet RPC, pool API or any other data source) in combination with a JSON expression how to find the property of interest in the data response. Basically a way of loading almost any value from almost any API URL. Awesome Miner will not be able to understand the JSON data responses from any data source, but if you specify something like "coinInfo.difficulty", Awesome Miner could lookup and use any value inside the data response. I'm still exploring this topic so I will not be able to share much more details at the moment. It would not be crazy to make your own api, mixing the data, and read that api from your server, so CC or CTM would not fall every so often. 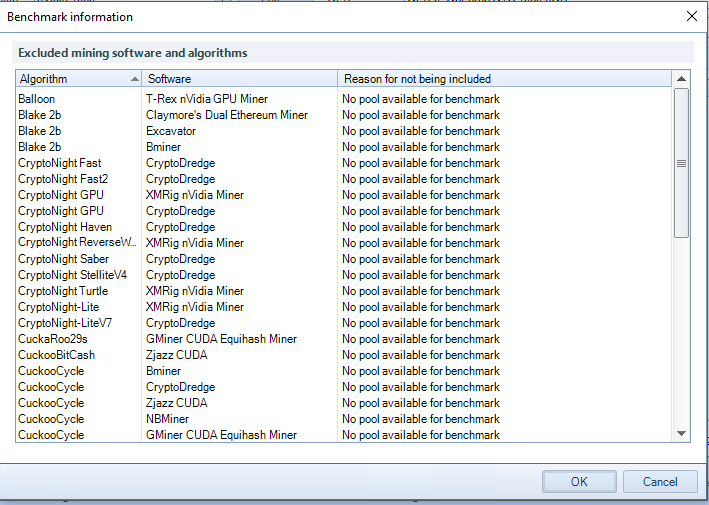 The problem here is that I don't own the data and I'm only allowed to consume it inside Awesome Miner itself. Otherwise I would like to have a service that combined everything and exposed it to Awesome Miner. complicated at the programming level is not. Neither do the data belong to CTM or CC, they are public and without intellectual property. we have two default selectors deactivated for everyone and only those who activate them choose a provider for Data and another for prices I do not think it is too complicated. It would be more difficult to create the menu in the corresponding window than the data mix programming. Also you do not mix them, it is the user with your risk who says, this currency, X gives me data and X gives me prices. I do not see it complicated at the development level. Taking into account that we ask for the data of the 4 apis every few minutes and we have them in the AW loaded. it's more that you want to do it Patrike, than the complexity that may have its development. I hope that in some update you dare to offer it. I have already spoken privately with CC and CTM, and none want to improve their api in exchange for a monthly subscription. They do not have eyes to see that there is an empty market niche, without competition, you just have to give all the data well, not just a part of them. I appreciate your feedback on this, but the focus of Awesome Miner is not on competing with the coin statistics providers we already have. For Awesome Miner it's all a matter of priorities, and all that would be nice to have is not realistic to focus on. To extract data of difficulty is not complicated, the complicated thing is the Scrape of the different types of script that there is to mount the Explorer, and that when they update it changes the scrape. I think that if we could read at least the HASh and difficulty of a coin in real time by adding the urls of the explorer, we would have the solution for CTM. But sometimes CTM also rewards do not have them well. Sincerely, create an API service that mixes the data and offer them with monthly subscription. I would buy. Put the service on behalf of another person outside of you and that's it. Neither will the others know where you are extracting the data, but we both know where we would do it ... If they do not want them, someone will have to do it. I will give more updates on this later on as there are both investigations and development in the pipeline. The focus is on having a very flexible way of loading coin properties from any JSON data source. The result is that I end up with a coin where most data is from CoinToMine, but two properties are loaded from other sources. Please note that Awesome Miner doesn't have any specific support for the Crex24 API here, you simply specify an URL and which property to read. I know that the above isn't exactly what you requested, but the goal is to have a solution as flexible as possible to begin with. I was trying to find out if it was just Equihash with a specific Personalization string or if this really was new algorithm. Do you have any details on this? For example, which mining software do you run for this coin and how do you specify the algorithm for it? Are you sure this isn't the "My Miners" group, but renamed and moved to the bottom? 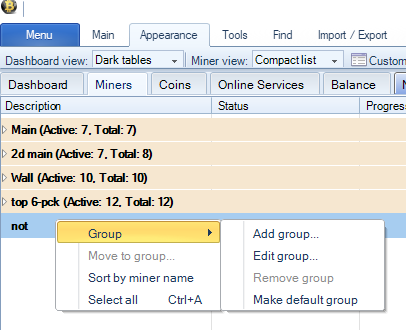 For the "My Miners" group - Even if you remove all miners from it, rename it and make another group default - you will still be prevented from removing this group. Is this the only empty group that cannot be removed? Thanks for letting me know. This algorithm required some special adjustments that I will include in the next release. On this topic I can also point out that I'm planning to add full support for Nanominer later on. I checked with gminer settings --algo 144_5 --pers auto, works fine. I think that on www.coincalculators.io something was confused. Every group. Every group I try to remove has "Remove" grayed out. Hello @patrike we can someday choose the sale or purchase price in CTM, as we do with CC. It could be the same option for both providers. @moopidoo what is your opinion about the possibility of mixing the data of the suppliers. You have not noticed your this comment from CC and CTM. I would like to know your opinion. AM's Balance feature already utilizes (customizable) explorer data to report wallet balance, hopefully patrike can work from this module's code to expand functionality to fetch difficulty and mining related data for the coins too. Thanks to both of you for all feedback. I think the first step here is to allow at least Difficulty to be loaded via a custom URL. I assume this is the most problematic property to get right and if you manually find another source where it could be loaded from, it would make sense to bring it in. For some coins there can also be variations in Block Reward. I will expore this a bit more and get back with an update later on. Thank you patrike for considering this, this would be of great help, as for other properties (block reward, developer fee, MN portion of the block rewards etc) that are usually not available via popular explorer such as ones based on Iquidus, I agree more planning is needed to save time and achieve a better result (talking about potentially getting block info right off the local running node via RPC API). because there are some differences (albeit similar) each explorer outputs API results according to available query methods, can we consider they are all selectable drop-down lists of fields, and have AM's UI let end users choose which one is the difficulty field? This is just one of many variations you can get from the wallet RPC on particular blockchain's info which is accurate and up to date, but since every coin dev tend to make little modifications here and there, the ability to target response field and response values to coin's properties would be greatly helpful and flexible. of course, all that (except getting difficulty from explorer API) are not something to be expected any time soon, but I thought it might assist in the planning phase if they were to be considered in the future to be implemented into AM, so the UI and workflow can be intuitive and user friendly. that is valid for the explorer based on the INQUIDUS scrytp, a scrape can be made and read. The problem that there is more scrypt to mount explorer. To me if you add it is something beneficial. Besides, as you propose, Moppidoo is very interesting, something is needed because CTM is killing me, although I have it as the first supplier. It has many interesting coins. The basic idea is not to compete against them. If not use your data more effectively. Anyway I hope your solution to be able to add the difficulty for a URL and scrape the data, as suggested by moppidoo that I see it quite right. The case is to have the data well in some way. I do not stop seeing coins with ridiculous difficulty and ridiculous nethash, like XVG in X17 with CTM., It enters the many others that I have already reported. Whatever it is, I'm sure it does what is right and proper, I feel insistent, I do not mention it anymore. Or currencies that I want to sell at a price and it's a little higher than the brand. In these cases and others I change some data. My suggestion is to put next to the name of the coin some indicator, a mini icon, an asterisk or something, that tells me that this currency has some important changed data (difficulty, price or reward), so I could see which ones I have modified, that Sometimes I forget it and I leave it for a long time.